When it come to Christmas sparkle, New York City is top star. Up and down the avenues trees are sheathed in blue, gold and silver lights. 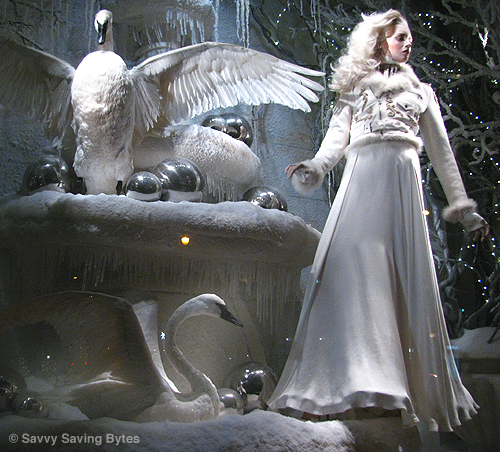 Fifth Avenue blazes with fabulously conceived store windows and decorations. 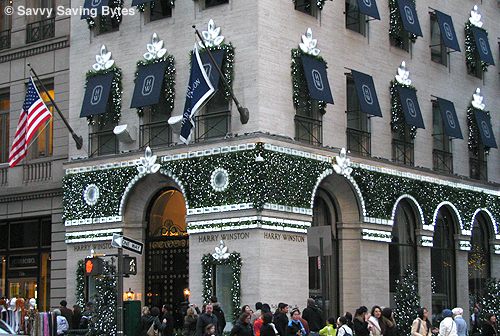 Normally a conservative player on the Christmas scene, jeweler Harry Winston illuminated his building this year with glittering diamond medallions and strings of gleaming gems. 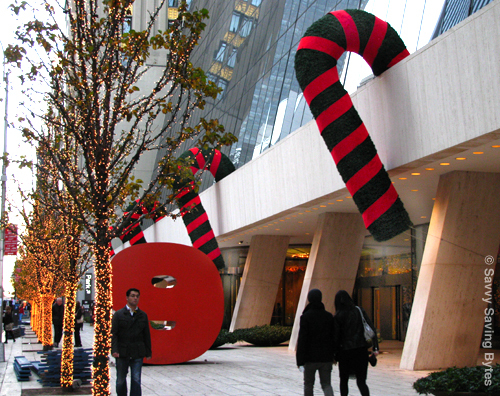 Middle: gigantic candy canes climb a skyscraper on 57th Street. Bottom: happily bucking the trend of headless mannequins in too many stores these days (making for deadly dull Christmas windows by the way) this window at Ralph Lauren shows why he’s king of display. Inspired perhaps by Dr. Zhivago, great drifts of snow and icicles adorn this gleaming interior. Graceful swans (why not!) take a winter dip among giant silver balls. The evocative scene manages to call up past Christmases and conjure up fantasies of what Christmas could or might be. Your photography gets better and better. We can’t wait to visit NYC. Just two more weeks! Meanwhile, the holidays are upon us. I turned in all of my assignments last week so I’m free! Well except for learning all of the music for this Sunday and Christmas eve. I will try to get a post up Christmas Day. Thank you for your compliment on my style progress since the days of my choir outfit for all occasions :). I still love that outfit, but can wait to wear my leather coat and gloves in NYC. Brrr. I hope it snows! Btw we’ll have plenty of time so let’s put our heads together re: a good time to meet up. Weather has been fairly warm for the season, but if it gets REALLY cold, you may need a sweater under that leather. I’m looking forward to snow too. I’ll be away during Christmas and won’t be checking my blog or comments, but will be checking my gmail. After the first my time is open. With all the relatives you’ll be seeing, I imagine your meeting times will be narrower. I’d love to meet you and Martin for dinner some night. Whatcha think? Pat, Mom wrote that after thinking about it she’d rather we not try to visit, so that’s freed up time. What about Tues 1/8 or Wed 1/9? Do you want me to recommend a place on the upper west side or do you already know of some good choices. We’re happy to come to your neighborhood if you like but you said there’s more choices by us. Wow, that’s really something about your Mom. Well, either day is good for me. Eight is supposed to be my lucky number so how’s about we do 1/8? Since you haven’t been here in ages I think you should pick where you’d like to go. Also think the upper west side has more fun and less pricey places than my neighborhood. One place I used to count on for a good Italian meal in the village – Montes – was a big disappointment last time I was there. Do you have a place you’d like to go or do you want me to look around? I’ll answer off-internet via email :).